There are a superb pair of galaxies that are ideally positioned during May for imaging, and I find myself drawn back to them year after year. The galaxies are M81, also known as Bode’s galaxy and M82, also known as the Cigar galaxy, both residing in Ursa Major. M81 lies at a distance of 4.5 million light years and shines at magnitude 6.9, whereas M82 is about 17 million light years away and is a rather faint magnitude 8.4. M81 is a nice spiral galaxy, whereas M82 (also known as Arp 337 a unique Arp galaxy, and NGC 3034) is a strange cigar-shaped irregular galaxy associated with an arc of three magnitude 20 quasars, and a peculiar jet of filaments (which show up very well under H-alpha) emanating from the nucleus. There’s plenty more yet in this region! 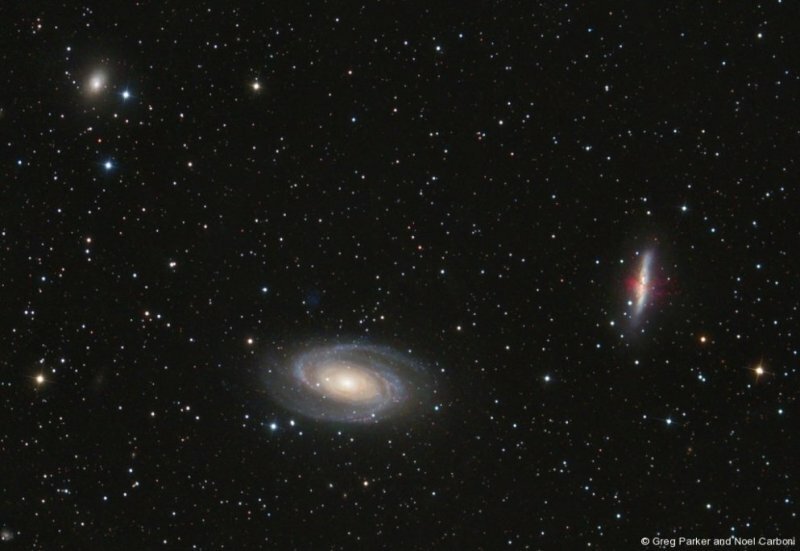 If your field of view is large enough you will easily pick up two further galaxies, the larger NGC 3077 at 10th magnitude lying 45′ SE of M81, and the smaller NGC 2976 also at 10th magnitude lying one and a half degrees SW of M81. But there’s even more. Laying very close to the outer spiral arms of M81 you may be lucky enough to pick up a faint blue patch of light. This is Holmberg IX, a dwarf galaxy that appears to be very dim indeed. However if imaged in the ultraviolet region of the spectrum, this galaxy blazes away like a beacon! All in all the M81/M82 region of Ursa Major is jam-packed with interesting objects well worth imaging with a large field of view and with very long sub-exposures to pull out the fainter treasures.